Birimian Gold Ltd (ASX:BGS) has joined the growing troop of explorers rushing out into the lithium exploration field, and the company continues to deliver strong drilling results from its current campaign. BGS moved into the lithium space earlier this year by acquiring 100% of the Bougouni Lithium Project in Mali, a large license area spanning some 250 km 2 , which hosts the high-grade, potential bulk-tonnage Goulamina lithium deposit. Drilling results thus far have been encouraging, exposing visible lithium mineralisation. The most recent results struck high-grade lithium intersections in shallow drilling at Goulamina. To date, five of eight planned diamond holes have been drilled, but those drilled so far have found “ spectacular zones of densely crowded spodumene ”. Diamond drilling continues as you read this, as BGS looks to evaluate the depth of high grade lithium mineralised pegmatite at Goulamina and augment recent high grade results from Reverse Circulation (RC) drilling. Before we go too far, it should be noted that for political and social reasons, this is a very high-risk stock. Getting mining projects up and running in countries such as Mali is no simple feat, and there may be challenges ahead. 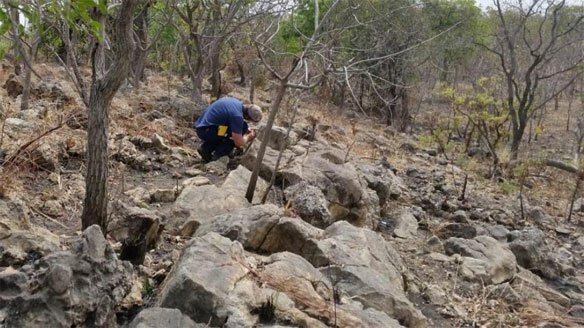 Notably, geological and mineralogical observations from the core sampling indicated low mica content – meaning that low-cost industry standard processing would be technically feasible at Goulamina. Based on these results and the fact that mineralisation continues along strike, BGS has committed to delivering a Maiden JORC Resource and Scoping Study by the end of this year. On the more imminent horizon (i.e. within the month) is news of 35 more drill-hole results. Just as the lithium market steps into the spotlight amongst investors and producers, Birimian Limited (ASX:BGS) is well on its way to defining its Maiden Resource at Bougouni and publishing a Scoping Study by the end of 2016. 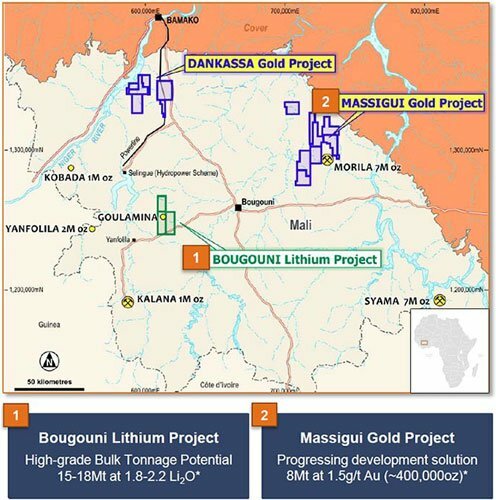 If BGS can demonstrate strong assay results and a likelihood of Bougouni being economically feasible based on assay results over the coming weeks and month, it could result in a significant revaluation for BGS. Take a look at BGS’ performance since we first wrote about the stock in the article Lithium Race Expands to Africa: ASX Explorer Secures High Grade Lithium Asset – BGS has been up as high as 98%. Furthermore, BGS has managed to raise its valuation by as much as 670% since the start of 2016. As it stands, BGS has set an initial exploration target of 15-18Mt @ 1.2-2.2% Li 2 O — a fairly competitive target when compared to the $636M capped Galaxy Resources’ 16Mt @ 1.1% Li 2 O and Neometals’ 23Mt @ 1.4% Li 2 O.
Lithium has stood out as one of the best performing metals in the world lately, bucking the downward trends seen in so many other commodities. 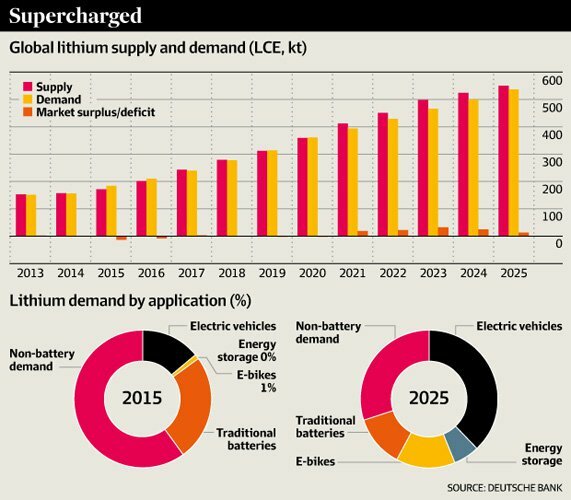 It’s why as of July 2016, there are more than 60 ASX-listed lithium explorers jostling for market position, in order to capitalise on the sharply growing take-up of lithium-ion batteries — charted below. 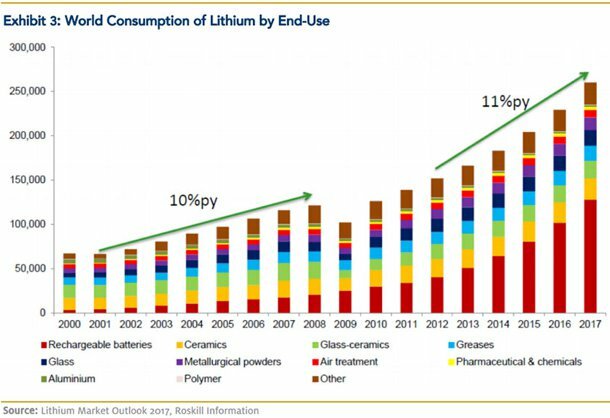 The reason for such frenzied lithium exploration activity is the dramatic increase in sale prices based upon expected future demand and dwindling current supply. The lithium market is closely linked to the current boom in lithium-ion batteries, which are doing well on the back of strong sales of electric vehicles. Take a look at lithium as a sector, as measured by the NASDAQ Global X Lithium ETF. Since the start of 2016, lithium valuations have risen by an average of 36%, while stock market indices such as the US S&P 500 have rallied a paltry 11%. As you can see, over the past 360 days, lithium prices have risen by 13%-47% depending on the exact specification. Earlier this year, lithium prices were trading even higher, but have eased on the back of expected increases in supply. Of course this is a metal we are talking about, and metal prices can fluctuate – it is anyone’s guess what the price of lithium might when and if BGS get to production – it could go down. So keep this is mind if thinking about this stock for your portfolio, and seek professional financial advice before making any investment decision. If we look at what this recent lithium exploration excitement has done to ASX-listed lithium companies, we can see that they have outperformed the broad ASX 200 benchmark by quite a margin and are closely reflecting investor sentiment that lithium demand is growing. Having gotten its hands on the Bougouni Project in Q1 2016, BGS immediately mobilised its exploration team, and initiated a 5000m maiden drilling programme on May 10 th . In our article, “Lithium Drilling to Start Any Day Now: BGS has Raised $3M and is Primed” , published the day before BGS initiated its drilling; we went into the details behind BGS’ Bougouni acquisition as well as plans moving forward. Well, it’s only late-July and already BGS has some excellent and encouraging data, and a firm commitment to getting its maiden JORC Resource plus Scoping Study done by the end of 2016. Since commencing RC and diamond drilling at the 250km 2 Bougouni Project, BGS has completed 42 drill holes for 3,639 metres, with the initial findings received being described as exceptional assay results . BGS later confirmed that wide and high-grade lithium mineralisation is present at shallow depths along the northern portion of the Goulamina Zone. The following map indicates Lithium pegmatite outcrop map with drill hole locations and reported drill intersections. BGS has found zones of densely crowded spodumene (which is lithium bearing) intersected in three up-dip holes drilled for resource estimation and metallurgical purposes adjacent to recent RC holes. Corresponding mineralised zones in the RC (25m up-dip) returned high grade intervals including 18m @ 2.10 % Li 2 O (within 50m @ 1.62 % Li 2 O). The drill core material from these holes will be utilised for additional processing test work. It complements previous test work undertaken by CSA Global consultants indicating high quality, chemical grade lithium concentrate could be produced using conventional processing techniques. Furthermore, geological and mineralogical observations from the new drill core confirm simple mineralogy and very low mica content, providing further confidence that low-cost industry-standard processing would be readily achievable at Goulamina. Deeper diamond drilling at the northern end of the currently defined mineralised zone has returned wide zones of visible spodumene (38m down hole width from 102.8m in hole GMRC027D) at depth beneath high-grade RC drilling (GMRC007 – 23m @ 1.96 % Li 2 O). The deposit remains open along strike to the north in this area and BGS believes there is good potential to continue to extend the bounds of the known mineralisation. 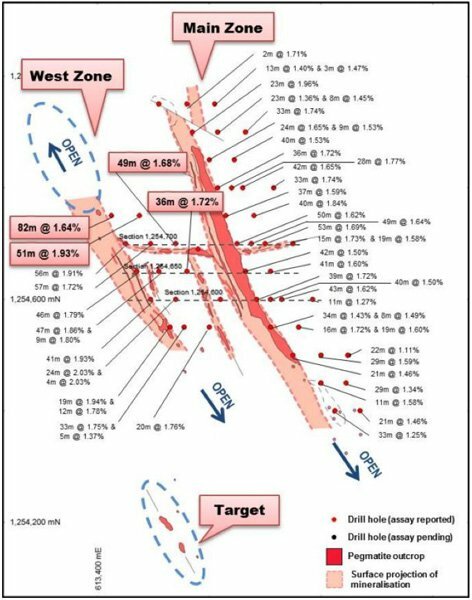 Additionally, a broad zone of spodumene-bearing pegmatite has been intersected in hole GMRC028D (34m down hole from 138.7m), which was drilled to a similar depth approximately 100m to the south of GMRC027D. These are highly encouraging observations which confirm broad and continuous mineralisation to in excess of 150m down dip from surface and could have a significant positive impact on the scale of the resource at Goulamina. RC drilling results continue to exceed expectations of mineralised widths and substantial, very high-grade zones (+2%) within the broader mineralised pegmatite are particularly encouraging. Meanwhile, analytical results are pending for the remaining 27 RC holes completed in the current program. Assuming the news flow is of a positive nature, we think we price sensitive catalysts may be on the horizon for BGS shareholders. However, this is no guarantee. An investment in BGS may not be successful, and you should also consider your own personal circumstances before choosing to invest. Although exploration is still ongoing and there’s more work to be done before ‘official’ JORC-verified conclusions can be made — BGS has been able to give investors a glimpse of what it can achieve at Goulamina. BGS reports that all its drill holes are indicating the presence of high-grade lithium mineralisation with the strong likelihood of high-grade concentrate being produced. Initial screening and separation indicate a grade of 6.7% — significantly higher than the industry average of 2%, typically needed for a project to be considered economically viable. Furthermore, BGS reports that its lithium recovery rate is ~85% and a high mass yield of 31.5% ; yet again strong initial estimates that should hold BGS in good stead for its Scoping Study and subsequent DFS. As part of the drilling program, BGS has identified multiple new targets to the West of the Goulamina Main Zone. This increases the possibility of BGS defining a high-grade JORC Resource, and improves the likely quantity of any resource that BGS discovers. Other factors that we think are favourable is the low strip ratios being reported by BGS geologists and the strong likelihood that Bougouni is highly amenable to bulk open pit mining. If BGS is able to establish an open-pit mine, it could greatly reduce operational costs and slash exploration expenditure given the ease of extraction open-pit mining provides. As you can see, BGS is fully committed to completing a Scoping Study by the end of 2016, which will quantify what BGS has under the ground, what it can realistically hope to extract, and how much it will all cost. The current drilling program will provide the necessary geological and grade data to estimate an initial JORC Resource, and, will pencil in future phases of exploration at Goulamina. 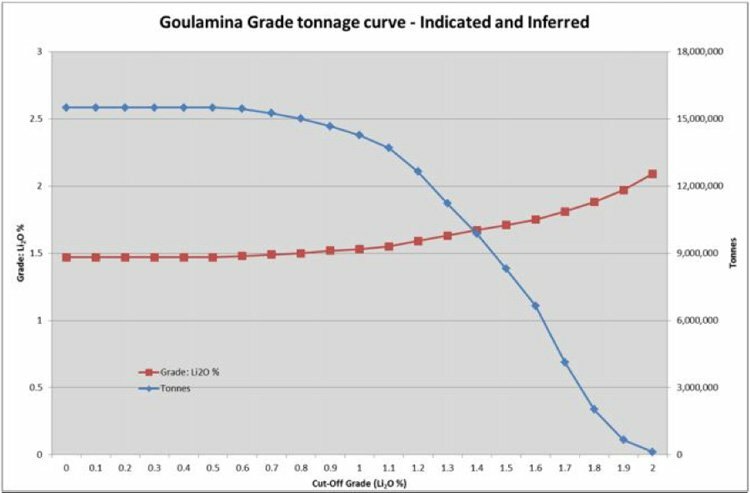 To ensure Goulamina reaches its aspirational targets and hopefully a multimillion tonne resource, BGS completed a $5M Placement to fully fund an aggressive evaluation program. BGS issued 20.83 million shares at $0.24 per share in late June , and is now well-funded for its exploration activities. By the time BGS releases its Scoping Study, it should also have its maiden JORC Resource in the bag, and be gradually progressing towards a Definitive Feasibility Study (DFS). 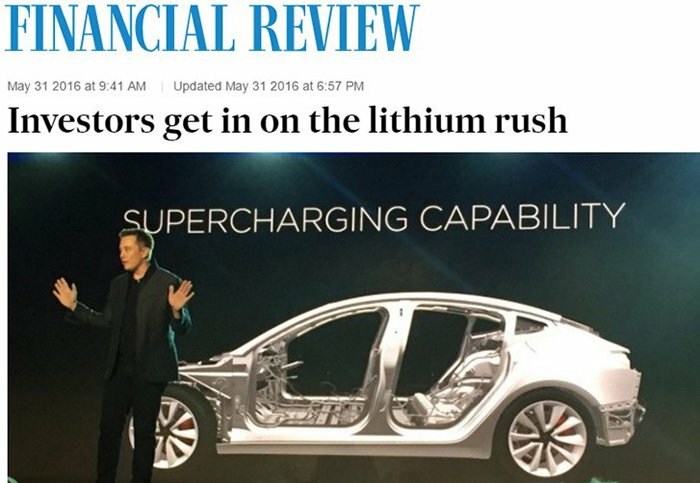 The blue-sky potential underpinning early-stage lithium explorers has been well reported. BGS is a small explorer with very big ambitions in the lithium space. Capped at around AU$46MN, BGS is already in sight of a high-grade lithium orebody with excellent geometry, open-pit mining compatibility and within a low-cost operational environment. With exploration ticking along nicely, catalysts just around the corner and the lithium market landscape blooming, BGS has wandered into fertile market territory with lush opportunities ripe for the plucking.